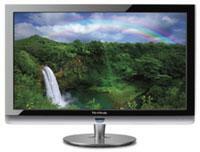 (without stand or speakers) 22.2" x 14.0" x 1.8"
ViewSonic’s 23" VT2300LED HDTV immerses you in the action with Full HD 1080p resolution delivering 100% of your HD signal for incredibly precise images. LED technology gives you sharper images – blacker blacks and brighter whites. Revel in the unparalleled definition and detail delivered by 8000:1 dynamic contrast ratio and the high brightness panel. Super-fast video response and advanced image processing ensure extreme clarity in all your HD entertainment. The integrated ATSC/NTSC/QAM tuner and multiple connectivity options including HDMI with HDCP give you all the inputs you need for game consoles, DVD and Blu-ray™ players and computers. Get maximum enjoyment in kids’ rooms, dens, kitchens or any room in your home with the beautifully styled, high-performance VT2300LED HDTV.